The Horse Ride Mimic is controlled by two independent motors so the type of ride can be varied. Virtual inputs can be used to stop the ride in its lowest position. The Pirate Ship Mimic uses motors to control the motion of the ship and the sliding doors on its side. Virtual inputs are also available to detect the ship in its mid position and to indicate when the doors are shut. The Teacup Ride Mimic uses motors to control the rotation of the ride, the spin of the cups and the opening gates. Lights on the rim of the base can be illuminated and a virtual input detects the position of the ride. 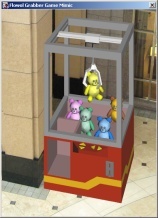 The Claw Game Mimic allows the user to win a teddy bear by controlling the four motors needed to manipulate the claw.